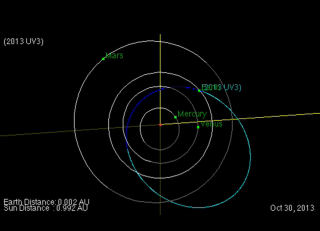 This illustration shows the trajectory of asteroid 2013 UV3, in blue, as it flies by Earth. A space rock the size of a tractor-trailer is set to fly harmlessly by Earth today (Oct. 29), zipping between our planet and the moon. "Small asteroid 2013 UV3 will safely pass Earth Oct. 29," reads a Twitter post from NASA's Near-Earth Object Program (@AsteroidWatch), based at the agency's Jet Propulsion Laboratory (JPL) in Pasadena, Calif. The space rock was first observed just a few days ago, on Oct. 25, according to data from JPL. The asteroid's path, illustrated in this video animation, will bring it inside the orbit of the moon, which typically circles Earth from a distance of about 239,000 miles (384,600 kilometers). When it makes its closest approach today at 5:44 p.m. EDT (2144 GMT), asteroid 2013 UV3 will pass 0.7 lunar distances from Earth, or 176,000 miles (283,000 km) away. The space rock is estimated to be between 39 and 89 feet (12 to 27 meters) wide, which means it is on the smaller end of near-Earth objects that NASA monitors as it looks for potential threats to the planet. Scientists with the space agency have estimated that they have catalogued more than 90 percent of the mountain-sized near-Earth asteroids, or objects wider than 0.6 miles (1 km). Such huge asteroids could cause destruction on a global scale if they were to impact the planet. But scientists have detected just a fraction of the smaller objects that could cause localized devastation. NASA researchers think they've found about 30 percent of the estimated 15,000 near-Earth asteroids that are around 460 feet (140 m) wide. Meanwhile, more than 1 million near-Earth objects that are about 100 feet (30 m) in diameter are thought to be lurking in space. Less than 1 percent of those have been detected, NASA estimates. And yet many researchers are working to boost that count. This month alone, scientists and amateur astronomers submitting observations to the Minor Planet Center in Cambridge, Mass. — a clearinghouse for data on minor bodies like asteroids and comets — have found 122 near-Earth objects and three comets. Observers have found 840 near-Earth objects and 50 comets so far this year.